Flags mark the way for a golfer's journey. Flags, the objects on top of the sticks used to mark each hole on a golf course, were first mentioned in 1875, although golf historians believe they were used before that date. The USGA doesn't require flags to be attached to flagsticks -- some courses top the sticks with other adornments -- but the vast majority of courses maintain the tradition by using cloth or nylon flags. The size of flags varies by course. The flagstick itself, however, is regulated by the USGA. The stick must be circular in cross-section and no more than 3/4 inch in circumference to allow enough room for the ball to drop into the cup. Also, it can't be padded or covered with absorbent material that can influence the reaction of a ball that hits it. The flags on a golf course are first and foremost used to give a golfer a visual marker for each hole. Whether standing on the tee area to hit a drive or hitting an approach shot from the fairway, golfers typically use the flag to help aim their shot to the green. By visualizing the most direct path to the hole, golfers can plan their shots to play the hole with the fewest number of strokes. At many courses, the color of the flag on the flagstick indicates the general location of the hole on the green. A blue or yellow flag typically indicates a pin position, or where the hole is located, at the back of the green; a white flag is used when the hole is in the middle of the green; a red flag signals a pin position at the front of the green. The flag colors may vary, though. Since the distance from the front to the back of the green can make a significant difference in terms of yardage, the colored flags aid golfers with their club selection. In situations where golfers must hit shots without having a view of the target, courses use a variety of methods to indicate when the target area is clear for a shot to be hit. This safety feature typically is used in tournaments, when the course is crowded, and involves marshals who monitor play. The marshals use flag signals and hand signals to communicate when it is safe to hit a shot. The purpose is to ensure that one group of golfers doesn't hit balls toward the golfers playing in front of them or the group following doesn't launch shots at their group. Rule 17 of the Rules of Golf governs flags and flagsticks. If a golfer hits the flag with a shot when the flagstick is in the cup, the next shot must be played from where the ball comes to a stop. 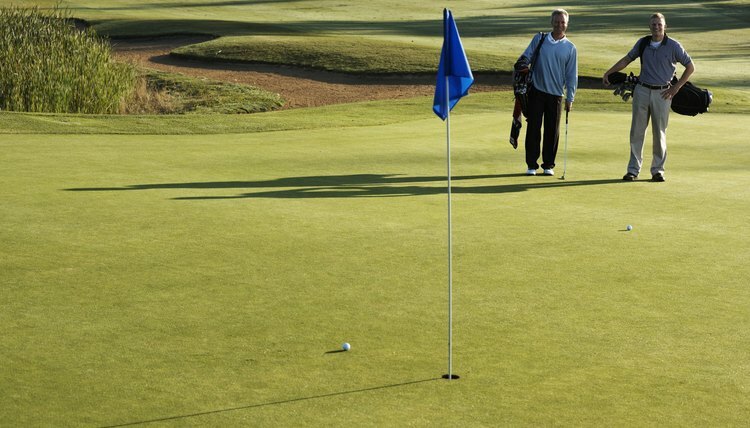 If you putt from on the green or if the flag has been removed for your shot, you are penalized if the ball hits any part of the flagstick, including the flag. Under Rule 17, the flag is considered part of the flagstick. What Does Honor Mean in Golf?